Our latest Texas Holdem poker scanning system is the most advanced device in predicting the outcome of Texas Holdem poker games. It can be operated by one person. No need computer system or partner, within 0.5 second you can know who are the first and the second winners, even the ranking of all players. The mini stealth earpieces will tell you the outcome of the Texas hold’em. Through a mini spy earpiece, it will tell you who are the winners even the ranking of all players. 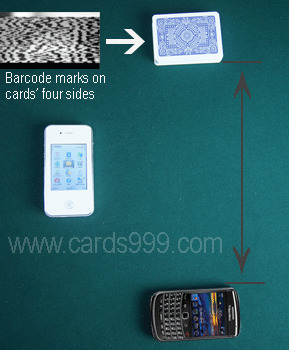 The accuracy is 100%.The whole set of poker scanner system equipment is portable. Poker analyzer system is easier and more convenient than marked cards contact lenses for poker players to use and you can directly know the winners within 0.5 second. Fast, accurate, easy, convenient and direct! If you need to watch the video of showing this system, please feel free and send an email to us! Texas hold'em poker analysis program uses only 52 cards, do not use the joker card, the game starts each player is issued two cards face down, as the player's "cards", is unique for each individual player cards only in the "fight card" when opened, so do not be regarded as a Texas hold'em poker game for license renewal. 10 a player to set the game (or 8 players, six players), through stealth wireless headphones (or headset) Play by 10 players or eight players play in order clues for the players size. Description: 3,5,8,9,10,4,2,6,1,7, Stealth headphones, the result can be drawn is the biggest winner for the 1, 2 is the second player the winner. According to customers of texas holdem poker analyzer system around the world, providing multi-language versions of poker scanning system manufacture: English, French, Russian, German, Japanese, Turkish, Portuguese, Romanian, etc., need to edit the language of chip production, processing, please book in advance for this poker product This product has been developed languages: English and Russian Language.